When it comes to housing your favorite ink pad, there are a few options to consider. We offer a selection of large metal industrial stamp pads to choose from for this purpose. These large industrial stamp pads are ideal for use with industrial inks or when you need to stamp a large area. These large metal industrial stamp pads can be used with water-based ink or permanent industrial ink. We also offer extra-large options to fit your needs. Choose from sizes of 9 x 12, 7x11 and 5x9 to find the one that will work best for your needs. 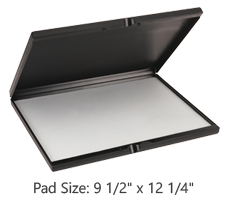 These stamp pads feature durable metal cases built to last for years for a great return on your initial investment. They are easy to open, but won’t open on their own for extra peace of mind. They are also stylish to look at with their clean white surface. PLEASE NOTE: If you are using permanent, industrial or waterproof ink with these large metal industrial stamp pads, we recommend storing the pad in an airtight container to extend the life of the ink. Permanent inks are alcohol based and can dry up if the lid is left open for long periods of time. When looking for a way to protect your ink and make it easier to take with you, these large metal industrial stamp pads are a great choice. If you aren’t sure if this product is right for you or have questions about this unique product, please contact us. We are happy to help in any way! At Rubber Stamp Champ, it is an honor to be your source for all your stamps, ink, and more for both your personal and professional stamping needs. We are confident you will find everything you need with our large selection of affordable products of exceptional quality. If you have any questions about our products or custom laser engraving, our team would be pleased to assist you in any way while shopping! Call or order online today! Stamp Pad Size: 9-1/2" x 12-1/4"